Some of you may be a long time subscriber to DUBL or a new comer. Either way, have you ever shopped through our Store Page? If so, you might have seen this book. I have a few products for sale, some hand-crafted cards and coffee sleeves, along with two books with this being one of them, Dancing Upon Barren Land – Prayer, Scripture Reflection & Hope for Infertility. For the most part I try not to use this blog space to “advertise”, however, for this post I am. So bear with me for a moment. Even though I’ve never experienced physical birth before, I liken the publishing of a book to birth. A woman BIG and pregnant. Like me, being BIG and pregnant with an idea to create a Christian resources for others hurting through infertility. Like a woman experiencing labor, writing a manuscript can feel like you’re in labor. Either hard contractions, quick or intense or like a long drawn out labor. The latter was the case for me. For years I always wanted to write and provide a Christian resource for those grieving through infertility like myself. I felt like there were very few, if any resources available in the market regarding infertility. Especially from a Christian standpoint 15+ years ago when I was in the thick of my infertility journey. It took me several years to write the book. Hence, the analogy of a woman in long labor giving birth to a child. I am not a fast writer by any means. It takes me awhile to get it all out. I don’t like to write for the sake of filling up copy on a page (including this blog space). Truly, I need to feel it before I hit publish. Some women, when in labor, choose to have a midwife. I had one during the writing process. Her name is Karen Porter. She was (is) a my editor, creative inspirer with ideas and mentor throughout the writing process. She could see things in me, where I couldn’t. She would challenge me to add this or that in the books’ creation. Truly, if it weren’t for Karen this book would’ve never been published. At one point, throughout this writing process, i.e. labor, I experienced the hardest contraction, the unexpected death of my mother to a complication from a simple surgery. Upon her death I was immediately thrown in to the full-on care of my father who was already in hospice care for his the disabling disease, myasthenia gravis. At one point I recall on a hot summer day Karen sitting cross-legged on my brown leather couch. I was lamenting to her how I couldn’t write any more. I did not have it in me. I was in grief due to my mother’s sudden loss and I was exhausted in taking care of my father. But her words inspired me. She said, “I feel if you don’t write you will go into depression.” The tears began to flow. Deep down inside I knew she was right. Again, another painful contraction bringing me closer to the birth of this book. Even though this book is not my memoir, per se, it is my labor story. (our story is in the Afterword of the book). As I’d write about the different topics, at times I’d lay my head upon the keyboard and just weep. I’d be reminded of God’s redemptive work healing my broken heart. It would then lead me to interceding, Praying for you, dear loved one...asking God to heal your heart as you’d read the printed words. Never in my wildest dreams would’ve I thought I’d be an published author. As a little girl I always wanted to be a ballerina. Go figure. 🙂 Yet when I came to know Jesus Christ as my Lord and Savior my fervent prayer was to be an INFLUENCER for Him. Never in my wildest dreams would’ve thought it would be in this way, through the birth of this book. If you’ve purchase the book already I want to say “Thank You”. If you feel all along on this barren road and have found it hard to pray during this difficult journey, then consider purchasing your copy HERE. The birthday of my book was January 2013. I’d love for you to read what others having been saying about ‘my baby’ (the reviews). A jewel of a resource. – Katherine Jones. A great help. – Christy H.
There are few things that can challenge one’s spirit in the way that trying to build a family through fertility treatment or adoption can, particularly when your efforts are met with disappointment. The uncertainty, fear, heartbreak, and feelings of inadequacy can be crushing. It can leave you feeling like you have nowhere to turn. 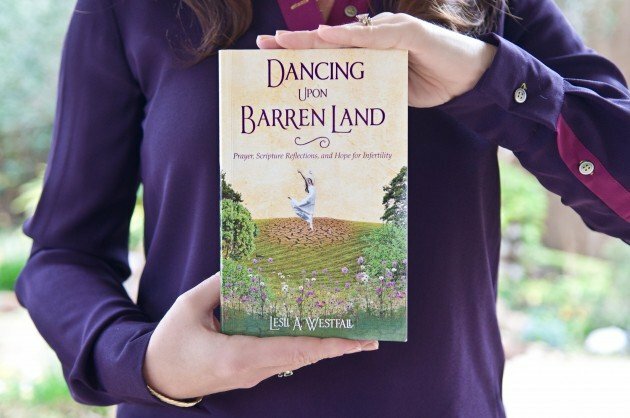 In this beautiful little book, Lesli Westfall speaks right to that pain and seeks to uplift her readers with well chosen scripture, and wonderfully written prayers. Since she has traveled this journey, Lesli’s prayers demonstrate an acute awareness of the sense of loss, challenges, and conflict that so many couples are faced with. Each speaks to a different issue and are so spot on! From adoption and finances to fear and baby-related holidays, Lesli generously offers prayers for all. I just wanted to say that having read the book, I’ve found it to be tremendously encouraging. In fact, after I read it, I didn’t put it back on my book shelf. It’s stayed on my night stand, so it’s close by if I’m in need of encouragement. Thanks for your kind compliment, Lisa. It means much to me!